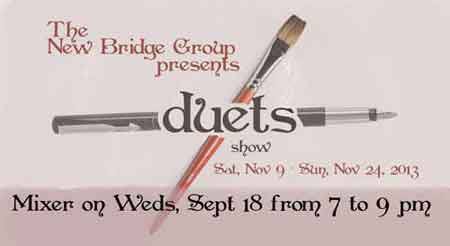 The New Bridge Group of Allentown, PA is putting on an upcoming collaborative show pairing visual artists with writers, poets, and musicians. The idea is to draw inspiration from a visual piece of art and have those individuals respond to it in their own way. I’m still looking for someone to pair up with, but may have some luck at the the “mixer” that is planned for the 18th of September. Opening Reception is on Saturday, November 9, 2013 from 7 – 10 pm. More information and the prospectus can be found on the show page here.